Tic-Tac: You know Victor's last words? Kovax: "I love this job." 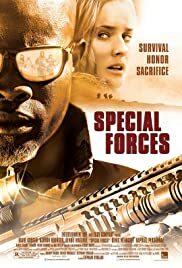 Forces Speciales tells the story of the French Special Forces and their mission, in this instance, to save journalists who have been kidnapped by the Taliban in Afghanistan and taken to the tribal areas of Pakistan. The covert operation develops complications and the sole lure of the movie is to discover whether the mission will succeed or fail; will they live or die. 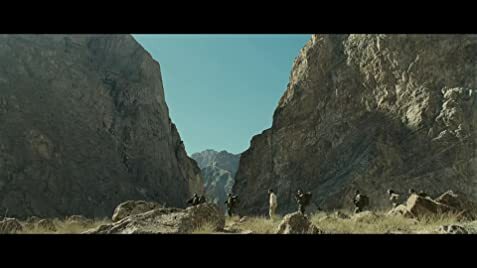 As one reviewer notes, the movie is nearly a commercial for the French Special Forces, and the plot of the movie, what there is of it, involves a kill-crazed Al Qaeda leader and his nameless and near-faceless band of zombie-like henchmen who relentlessly pursue their victims. Whoever gets in the way of this insane band of thugs, Afghan, Pakistan, foreign soldier or whatever, they seem to crave killing them quickly. And, the supply of these killers seems limitless, offering the viewer ample opportunities to watch them machine-gunned down in large numbers by the heroes, including a few scenes that include an accompanying heavy-metal music soundtrack. Yes we see the heroism, self-sacrifice and compassion of the gallant French warriors, along with the typical scenes of male-bonding. But much of this movie is standard fair for the genre, and a very one-dimensional look at the problems of this troubled area of the world. If you think that suits your taste, go for it! One last comment, when will we stop seeing overweight, gray-haired men portraying elite commandos? This is a young man's occupation. I'm surprised we didn't see Jean Reno as the commando leader, but that would have been even more difficult to believe. 42 of 77 people found this review helpful. Was this review helpful to you?